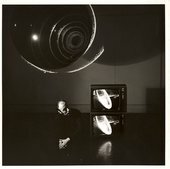 Aldo Tambellini (b.1930) is a pivotal figure at the heart of the shift to expanded media during the 1960s and one of the earliest artists to use video and television as a medium. Retracing Black, a new ‘Electromedia’ installation conceived for the Tanks, brings together his early innovations in painting, slide and film projections, video and sound to create an immersive media environment. To contextualise the installation, this screening surveys a selection of his landmark films and videos.